Looking for a sweet summer adventure? Start small: BC’s berries might be bite-sized, but they pack a powerful sweetness that’s sure to make some sunshine-filled summer memories for your family. Whether you’re on the hunt for strawberries, blueberries or raspberries, we’ve got details on where to find local, and what to look for in the best berries. BC is a berry powerhouse, providing strawberries, raspberries, and over 150 million pounds of blueberries every year around the world…and on your doorstep. BC strawberries peak from June to early July, although some varieties (like Albion) are available until September. BC’s blueberry season runs from the end of June until mid-September, and our raspberry season peaks from July to September. To keep your berries perfectly fresh, keep them cool and don’t let them linger in a bag for long - making berries your last pick-up of the day is an easy way to ensure plump fruit when you get home. Are you planning a berrying afternoon with kids? Our friends at Better Together BC put together a guide to planning the perfect trip. To find a strawberry farm near you, try BC Strawberries’ farm search tool. BC Blueberries features a search engine that lets you filter between farm direct, frozen, organic or U-Pick farms as you plan your berrying expedition. And BC Raspberries’ search tool cross-lists farms that offer raspberries along with strawberries and blueberries. 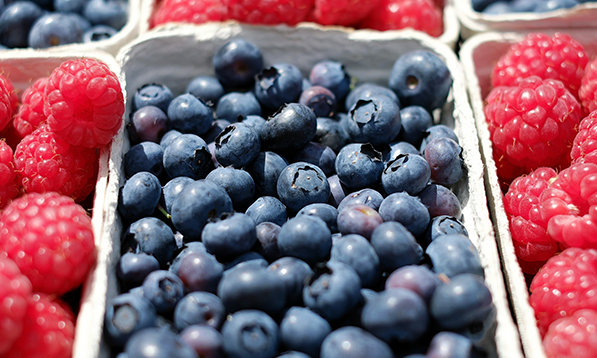 Once you’ve picked a flat or two of berries, it’s time to get cooking! In the mood for fresh? Start with this Glazed Strawberry Spring Salad. Then, move on to Rib Eye With Raspberry Sauce, Black Bean Veggie Burgers With Blueberries or Raspberry Ginger Baked Salmon. Quick Blueberry Sorbet and Strawberry Pie are two crowd-pleasing ways to end a summer dinner under the stars. Our friends at BC Strawberries are running a contest during berry season that’s easy to enter: simply snap a photo at the farm or restaurant, in the kitchen, or with family and friends using the hashtag #BCStrawberries. Submit your entry at enter.bcstrawberries.com before July 3, and you could be entered to win $100 gift certificates to a variety of partners (including Cartems Donuts and FABLE), or $50 gift certificates to partners, plus other fabulous prizes. If we’re making you berry hungry, join us on our Facebook and Instagram feeds! We’ll be sharing more summer fruit recipes this month, and featuring some of our favourite BC farmers. Looking for a sweet summer adventure? Start small: BC’s berries might be bite-sized, but they pack a powerful sweetness that’s sure to make some sunshine-filled summer memories for your family.